Shark Valley, on Tamiami Trail (US-41) 25 miles west of the Florida Turnpike (in Miami) has a 16-mile tram road (that's not why it was built by the oil industry, but that's what the park service uses it for now) that is usable after the park closes. One neat thing would be a moonlit bike ride (instead of going the day of the full moon, go three days earlier. Then, instead of rising at sunset and taking a few hours to gain enough altitude to cast good light, the moon, which will already be very full, will be at a good height when the sunlight first fades). Of course, when the park is closed you will have to park on Tamiami Trail and walk your bike around the traffic arm. If you are a photographer (or just an avid nature-lover) the neatest thing would probably be to take your bikes out there at (or before) sunrise. That's when a lot of exciting stuff happens. That's what we did this day. We were on an early morning bicycle ride when we came across these two. 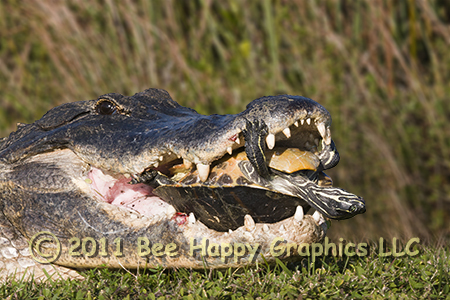 Alligators have tremendous crushing jaw strength, but the turtle is just the right size to be cradled in the alligator's mouth with the teeth barely touching the shell. Apparently, alligators aren't that bright. While we watched, these two would go through the same routine over and over. The alligator would lift its head and try to swallow the turtle whole, but the turtle was too big and would usually fall to the ground. The alligator would reach over and pick it up again. Then it would rest its head on the ground and close its eyes. The turtle, who up to now had appeared dead (the neck was outstretched longer than I knew possible and the legs were back), sensed the alligator relax and would raise its neck and arms and try to push the alligator’s jaws apart. Although Nancy was rooting for him, this would only wake up the alligator, who would repeat the whole process and throw up its head to swallow the turtle whole. We don’t know how this encounter ended, but there is reason for hope for the turtle. After watching for twenty minutes (about five iterations of this routine), we decided to move on to take the best advantage of the early morning opportunity. When we returned maybe an hour later, neither party was there, and there was no evidence of the turtle's demise. By the time we got back to the entrance, the park was open and Nancy was telling this story to the tram driver. He said he's seen alligators carry big turtles around for a couple hours before realizing they weren't getting anywhere and letting it go. I don't normally pay much attention to such theories, but after watching these characters go through the same routine for the fifth time, I began to wonder if the National Park Service hadn't bought a set of animated wildlife robots from Disney to keep the after-hours guests amused. Had it been a deer instead of an alligator, I would have tested that theory. As it was, even though his mouth was already full, I wasn't so inclined. During the day, the park rangers would take in the robots; that could be why both parties were gone when we went by later. And when Nancy was discussing these events with the tram driver, you wouldn't really expect him to admit to this program would you? Again, we don't know how this encounter ultimately turned out. Maybe on the 12th try the alligator finally prevailed. Maybe the turtle is telling his grandchildren this story today. Maybe due to budget cuts, the park service was forced to quietly sell off their inventory of animated robots. When you order this picture you can come up with your own ending to this story. The mascot of the University of Maryland is the terrapin (turtle). We can place that school's name on the shell of the turtle in this picture (upside down, even), if you like. We can, citing "artistic license", put "University of Miami" on the shell. One thing I am not allowed to do under any circumstance (because someone very near and dear to me went to a different university in the Sunshine State) is to put "Seminoles" or any words to that effect. Photographic details: Canon EOS 20D camera w/ EF 100-400mm f/4.5-5.6L IS USM lens set at 250mm. Camera was on f/18 for 1/250 sec at ISO 400. Fine Art Paper 10" x 17" 13" x 19"